A Texas Maize Platter Fit for a Pope In Yonkers, N.Y., on Saturday, Pope Benedict XVI will receive five platters of staple foods representing world cultures. The presentation is rooted in a Slovenian tradition in which distinguished guests are greeted with bread and salt. A maize platter is traveling all the way from El Paso, Texas. 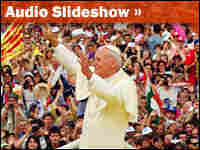 In Yonkers, N.Y., on Saturday, Pope Benedict XVI will receive five platters of staple foods representing world cultures. The presentation is rooted in a Slovenian tradition in which distinguished guests are greeted with bread and salt. A maize platter is traveling all the way from El Paso, Texas. Today, Pope Benedict XVI received his first greeting of many in the U.S. The pope arrived at Andrews Air Force Base for a six-day tour, and President Bush, Laura Bush, and their daughter Jenna were there to meet him. During his visit, Benedict will lead a mass at Washington, D.C.'s new ballpark and then travel to New York later this week. There, he'll address the United Nations. And then, the pope attends a youth rally in Yonkers. He will, there, be welcomed with five large platters of staple foods — bread, rice and maize. Not as sustenance, says Veronica Rayas, but as symbols. Dr. VERONICA RAYAS (Co-Director, Catholic Youth Ministry, Archdiocese of New York): It's something that connects all of us as humans around the world. And then, within our Catholic tradition, Jesus is the bread of life. NORRIS: Rayas is co-director of Catholic Youth Ministries with the archdiocese of New York. She's one of the planners of Saturday's rally. She says the idea for the platters is rooted in Slovenian tradition where distinguished guests are greeted with bread and salt. But these five platters, each 27 inches long, also represent different parts of the world — dark breads for Eastern Europe, white breads for Western Europe and North America, a rice platter for Africa and Asia, unleavened bread for Asia and the Middle East, and maize for Africa and the Americas. It's unlikely Pope Benedict will actually sample any of this, though he could be tempted if he hears Matthew Reich of New York's Tom Cat Bakery. His bakery is preparing the dark bread platter. Mr. MATTHEW REICH (Chief Operating Officer, Tom Cat Bakery): Black round rolls, and we're going to have a honey wheat cream pull-apart, raisin walnut cranberry batards, seven-grain pan rolls, and a dark German rye bread made with Brooklyn brewery chocolate stout. NORRIS: And filling out the maize platter. Ms. ROSA A. SAENZ (Owner, Los Bandidos de Carlos and Mickey's Restaurant): Sweet tamales, corn tortillas, gorditas, a dessert that is called sopapia. NORRIS: That's just some of what Rosa Saenz is making. She's the owner of Los Bandidos de Carlos and Mickey's - that's a popular Mexican restaurant in El Paso, Texas. Saenz is no stranger to cooking for dignitaries. She's made special deliveries to the Rolling Stones and Al Gore. But this is a distinct honor for Rosa Saenz. She's a devout Catholic, and the only non-New Yorker to supply a papal platter. So she's not taking any chances with conventional shipping. Instead, her sisters, brother-in-law, and mother will be flying to New York this week with a special carry-on full of tightly-wrapped food packed in dry ice and sealed in Tupperware. And they are traveling first-class.